Miles walked 2018: 345 / 1,000 on the 1,000 miles in a year challenge. Another Bank Holiday weekend came and went. As we are trying to create a pond and seating area in the garden, Saturday and Sunday was spent trying to make some progress on that but, due to the heatwave, it was just to hot to work outside for long. I also had an appointment at 2am Monday to drive the eldest daughter and grandson to Luton Airport as they were flying out to see our youngest daughter who is living in Iceland for a year, working with the Red Cross. I’ve been a bit ‘between books’ recently in my reading but took up Bill Bryson’s Road to Little Dribbling again. After reading Notes from a Small Island many years ago – which is laugh out loud funny – I thought I’d laugh as much at Bill’s second travel journal around Britain. But I had struggled with it a bit at the beginning and moved onto something else. But now I was back into his journey and warming again to his description of our eccentricity and, at times, nonsensical approach to life. As I tried to settle down for a couple of hours sleep, I got to the chapter where Bill Bryson visits East Anglia, where we live. He writes about Sutton Hoo – a place we have visited a couple of times but no for a while. His take on Sutton Hoo stirred my interest in the story of King Rædwald of East Anglia. Rædwald reigned from about 599 until his death around 624. Sutton Hoo is of primary importance to early medieval historians because it sheds light on a period of English history that is on the margin between myth, legend, and historical documentation. Use of the site culminated at a time when Rædwald, the ruler of the East Angles, held senior power among the English people and played a dynamic if ambiguous part in the establishment of Christian rulership in England; it is generally thought most likely that he is the person buried in the ship. I got back from the airport run around 5am and tried to get a bit more sleep. After breakfast I suggested to Mrs E that we should go out and perhaps visit Sutton Hoo. I knew if we stayed at home it was way to hot to work in the garden and if we stayed in I’d just doze all day in the chair trying to catch up on sleep. So we packed a picnic (but forgot the picnic blanket!) and headed off to Sutton Hoo. The place was heaving and we eventually parked in the overflow car park. After showing our NT passes to get in free we took the free map and decided to do a perimeter walk as we hadn’t done that before. Also most people stay near the burial mounds and the museum and don’t venture further afield. But first, I wanted to see the amazing helmet – or a replica at least – of King Rædwald. Soon we were on the walk and, sure enough, we had the woodland walk almost to ourselves and escaped the crowds. We met a dragon and walked through peaceful woodland. When we got back to the centre we found a couple of free deck chairs and sat in the shade of a tree as we ate our picnic. The day’s total was 5 miles of walking – not a huge walk but a bit more than my average day, and all eats into the 1,000 mile target for this year. 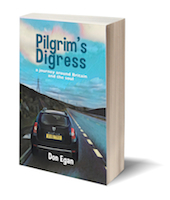 To date I have walked 416 miles – that’s 6 miles further than the length of the A1 (which is 410 miles long). 416 miles is exactly what I should have walked by the end of May to stay on target so that’s reassuring. Right, I off now to go and collect daughter and grandson from Luton as they are returning shortly from their Icelandic adventure. Jesus told his disciples: ‘I am the vine and you are the branches.’ (John:15:5). In our time of silent waiting we are allowing the sap, the life that flows in the vine, to flow through the branches. We are not seeking union with God. We already have that. Our task is to remain close to him and enjoy that union. ‘It’s not that God comes to us, as if he were absent,’ Augustine reminds us. ‘or even that we “go” to him. God is always present to us but we, like blind people, do not have the eyes to see him.’ In order to see God we have to enter a new relationship with him, enter into a new place. ‘It was in my inmost heart,’ wrote Augustine, ‘it was there, Lord, that you made me begin to love you, and you made me glad at heart’ (Confessions 9.4). The awareness of our union with the life-giving vine, the unknown sweetness that we find in our inmost heart, is not achieved without a struggle. It is a struggle between our surface-self, the person on show to the world, and our deeper self. No. I didn’t run it! Sunday morning was an early start driving to Redbridge tube station to go into London, where our eldest daughter, Beckie, was running the London Landmarks Half Marathon. We’d lost an hour’s sleep as the clocks had gone forward for British Summer Time the night before. There was an app that tracked each runner so we looked up Beckie and had a live visual on the map of where she was. We wanted to cheer her on at several points so we spent the day walking briskly between various points on the track to catch up with her. A great day, with a fantastic atmosphere. Beckie was running to raise money for Great Ormond Street Hospital (G.O.S.H. ), where our son, her little brother, had died in 1987. She’d been to visit the house where we lived in London the night before, and memories of her little brother flooded back, making it an emotional time. As we chased about, we passed some of the bus stops and train stations we used to use when we took him on hospital visits when we lived in London in the 1980s. Quite and emotional day. Beckie exceeded her target and raised about £600 for G.O.S.H. We clocked up 7 miles of our own chasing Beckie around the 13+ mile track! A lovely atmosphere and lots of £ raised for many charities. Great day. I’ve decided to challenge myself to walk 1,000 miles in a year – by 31st December 2018. It only amounts to an average of 2.7 miles a day, so it’s achievable. But it will require commitment. By yesterday I’d completed 53 miles. I’d have got further but my decision to attempt the 1,000 miles in a year coincided with my right knee playing up. Nothing too serious but sometimes a bit too painful to walk very far. I only made the decision to walk 1,000 miles a few days ago but fortunately my Apple Watch has been tracking my walking distances since the first day of the year. As you can see from the table below, some days I fell short of the 2.7 daily target but other days did more. As the days get longer they’ll be more opportunities to walk further. I’ll be posting pictures and thoughts about my journey through this year. Tomato & Basil Sauce – sugar free! In any supermarket the shelves are stacked high with ready mixed cooking sauces in jars. They are very convenient and that’s why millions of jars are sold every day. The downside? Many of them have a high sugar-content when really most of us are trying to cut down on sugar intake. 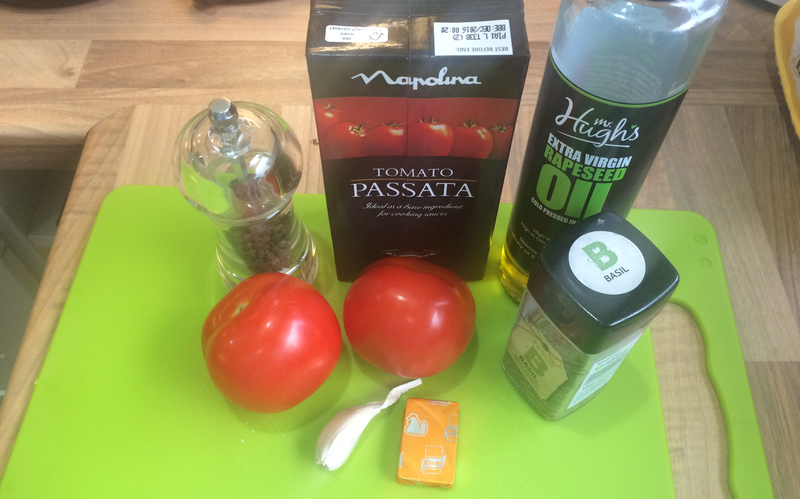 When it comes to Tomato and Basil Sauce, not only does it not need sugar – it actually tastes loads better without it! This sauce is REALLY easy to make in a couple of minutes. Put all the ingredients in the pan, as follows, before putting on heat. Pour a glug of rapeseed oil in a saucepan. Chop the tomatoes and add to pan. Add a stock cube – chicken or veg cube are fine. Sprinkle over with the dried basil. Add a few twists of ground black pepper. Add a pinch or two of salt. Put the pan on the heat and let it start to bubble. Turn down to a very low simmer for a few minutes, stirring occasionally. Pour over chicken breasts or pasta for a great taste – sugar free! Over the last couple of years of intentionally trying to improve my diet, one simple habit stands out as the easiest and possibly the most effective change I made. A daily dose of banana. A banana gives an instant, sustained and substantial boost of energy. Bananas contain three natural sugars – sucrose, fructose and glucose combined with fiber. There is no question that bananas give us a great energy boost, that’s why they are popular with athletes. But bananas also help protect us from several illnesses. 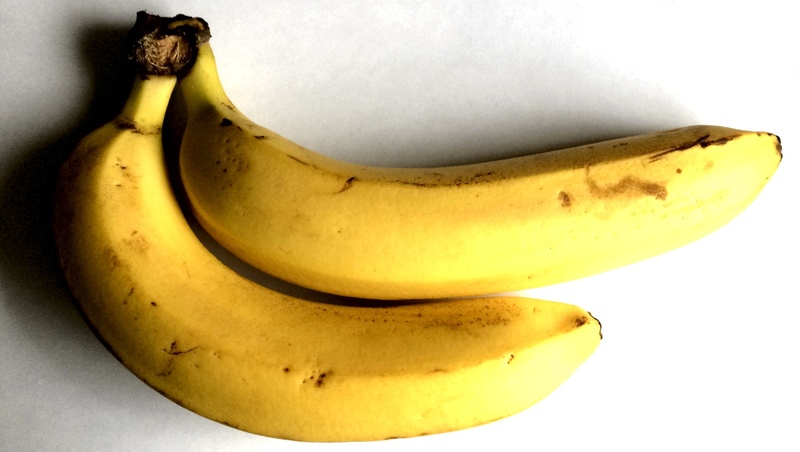 Blood pressure, anemia, constipation, nerves, and ulcers are all often eased by eating a banana. According to a recent survey undertaken by MIND, those suffering from depression felt much better after eating a banana. This is because bananas contain tryptophan, a type of protein that the body converts into serotonin, known to make you relax, improve your mood and generally make you feel happier. The old saying, ‘an apple a day keeps the doctor away’ should be updated to a banana a day. I prefer mine when they are nice and ripe, with a few brown dots on the skin. I have one chopped into my porridge every morning for breakfast, with a spoonful of honey. I also use them in my fruit smoothie recipe. Go on. Have a banana! 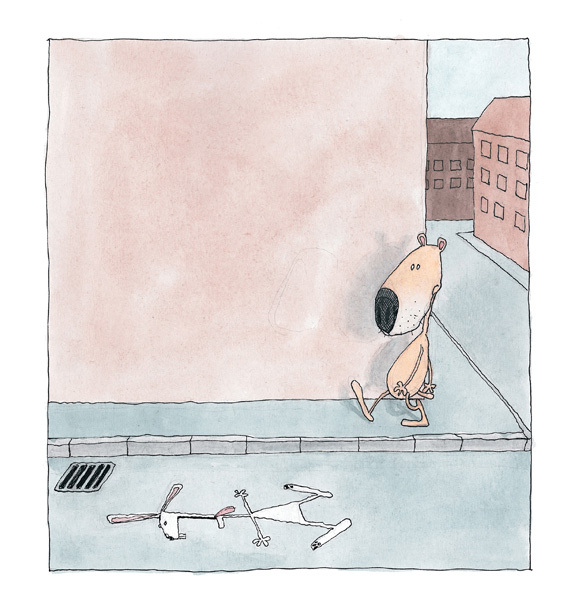 Yesterday I was quite moved by an article I read about a children’s book that deals with grief. The Flat Rabbit is by Scandinavian children’s book author and artist Bárður Oskarsson. A dog is taking a walk when he discovers a rabbit lying completely flattened in the road. He is quite disturbed by the find and is soon joined by his friend the rat. They imagine lying flattened in the road is no fun so they think they should do something for the poor rabbit. But they are not sure what. They go to the park for a while to sit and think. The dog finally has an idea and they return and collect the rabbit from the road. 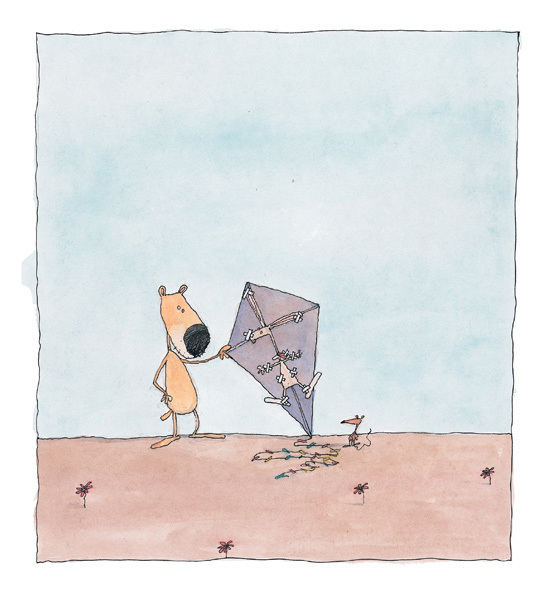 They work all night in the dog’s workshop and build a kite. 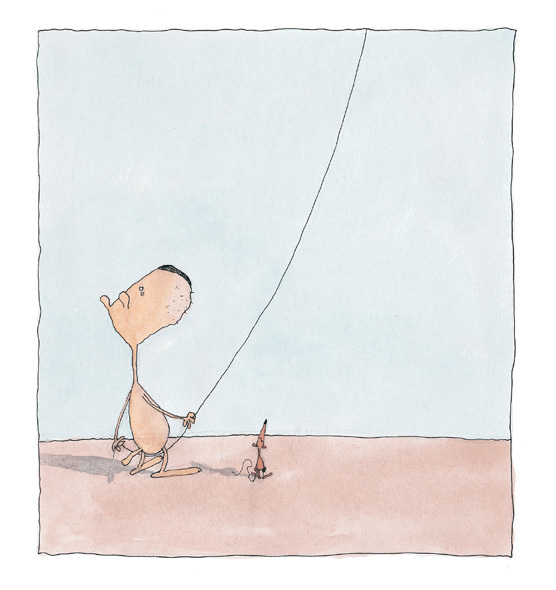 They lovingly attach the rabbit to the kite and then, after many failed attempts they get the kite and the rabbit flying. I was quite moved by the story because it gently explores the real messiness of grief and loss. Those left behind seldom know what to do, yet feel they must do something. 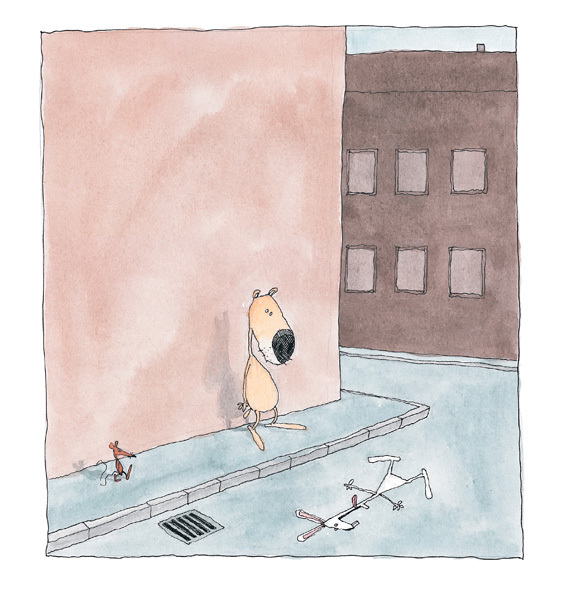 Grief has been a huge part of my story and, watching the dog and the rat struggle to know what to do with the rabbit, I see a reflection of my own confusion about what to do with grief. I’ll be thinking about the flat rabbit and her friends trying to cope with their loss for weeks to come, I think. The Flat Rabbit is available on Amazon here. The three short years of my son’s troubled life were torture. I thought the bad days would never end. His deformed heart would suddenly cause his blood pressure to drop and he’d pass out. He was in and out of hospital all the time. Various medicines had to be taken several times a day to keep him alive. When we went out as a family we took a whole pharmacy with us wherever we went. After he died, shortly before his third birthday, I entered a dark place of not coping that, thirty years later, is only just coming to an end. When you are going through something frightening or unpleasant, it sometimes feels that this bad period of your life will never be over. Often it feels like the good times play out too fast and the bad times play in slow motion. Life doesn’t have a fast forward button. Sometimes it feels like our ship has sunk and we are cast adrift, swimming in an endless ocean with no sight of dry land. How long can we go on? But I have learned to look for seagulls. We may not see the dry land of hope yet, but seagulls never fly too far from the shore. Even a lone seagull can give us hope. Then a few more appear in the sky. Land must be near. Our trial will soon be over and we will stand on solid ground once more. I don’t know what trials you may be facing today. But don’t give up. Look for the seagulls. Look for a small sign that something is changing for the better. You may not yet have what you hope for but the seagull means you’re not far off. Hang in there. Dry land is coming soon.